Jerusalem, Israel - Jan. 29, 2019 - Thirteen bio-companies based in Jerusalem with revolutionary healthcare solutions with the potential to change the world were highlighted on Monday, at the Azrieli College of Engineering, located in Ramat Beit Hakerem. The evening event was organized by JLM-BioCity, a non-profit organization, led by volunteers, focused on developing and excelling Jerusalem’s bio-community. Besides company representatives, potential advisors and investors, marketers, and job seekers, were students and interns from Michlala, Touro, Hadassah and Azrieli Colleges. Deputy Mayor of Jerusalem in charge of Foreign Relations Fleur Hassan-Nahoum opened the program with greetings. A welcome from Professor Rosa Azhari, President, Azrieli College of Engineering followed, preceding the six featured startups presenting. * Avi Kleiman, CEO, of RenalSense developed an early detection of acute kidney Injury for ICU patients through real-time monitoring of urine-flow. 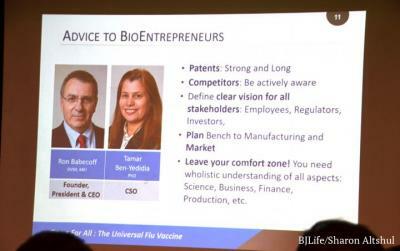 * Dan Teleman, CEO, explained Atox Bio which treats necrotizing soft tissue infections ("flesh eating bacteria") using Immunomodulators. * Joshua Phillipson, Head of business development, stated BiondVax has developed a vaccine that could eradicate the flu with one injection, different from the annual flu shots we have now. * Sagi Brink-Danan, CEO & Board Director, of HIL Applied Medical showed slides demonstrating a new class of ultra-compact, high-performance cancer proton therapy systems. * Josh Hexter, Chief Business Officer, explained Brainsway a noninvasive, non-drug brain disorders treatment for depression, OCD, PST, achieving outcomes not thought possible with traditional medical solutions. * Simcha Edell, CFO & Co-Founder Argaman Technologies filled in for Jeff Gabbay, CEO and founder, demonstrating cotton processes to make self-sterilizing sheets and clothes. However, Edell's mention of these special fabrics ability to remove wrinkles captured the audience attention even though it was last presentation of evening. * ENLIVEX THERAPEUTICS - cell-based therapy for rebalancing the immune system to control severe immune attacks on multiple healthy organs, to impede Sepsis, solid tumours, BMT. The program was moderated by Yaron Suissa, JLM-BioCity CEO, assisting in organizing and running the program were Joe Van Zwaren and Avigail Frij of JLMBioCity. The JLM-BioCity event was also sponsored by the Azrieli College of Engineering, Atobe and the Orthodox Jewish Chamber of Commerce (USA).